A national debate is taking place that promises to intensify in coming months: Should government tax purchases made over the Internet? If not, why not? And if so, how? While the question of federal taxation is certainly alive, most of the focus to date has been on the question of state and local government taxation. In February, Governor John Engler testified before the U.S. Senate that he favored improving collection of current sales and "use" taxes, which already technically apply to Internet, catalog, and 1-800 number purchases made by Michigan citizens, but which in practice are rarely paid. He emphasized the issue of tax "fairness," saying that it is unfair to tax traditional "bricks and mortar" businesses six percent on their sales while exempting sales over the Internet from the same sales taxes. Engler was careful to oppose federal efforts to either create new taxes or interfere with states' rights to set their own tax policies, but he did endorse a proposal by the National Governors' Association (NGA) designed to extract more revenue from Internet purchases. The NGA plan would have states employ "trusted third parties" who would track information about consumers, purchases and location to determine the amount of tax due and ensure that the revenue is routed to specific state and local government bank accounts. But two problems arise with the governor's position on Internet taxation. The first is that Engler's case for "fairness" in taxation undermines other taxation positions his administration has taken. For example, the Engler administration often has bestowed special tax breaks, favors, and even direct subsidies on certain businesses at the expense of fairness and uniformity. Such discriminatory tax policies are the hallmark of the governor's Michigan Economic Growth Authority (MEGA) and Michigan Economic Development Corporation (MEDC) agencies. is at odds with the Clinton administration's proposed "global free trade zone" for international commerce and could threaten American sovereignty. In 1998, Congress passed the Internet Tax Freedom Act (ITFA), which instituted a national, three-year moratorium on "multiple" and "discriminatory" taxes directed at electronic commerce. That moratorium is set to expire in October 2001, and the federal Advisory Commission on Electronic Commerce (ACEC), created by the ITFA, is scheduled to release its recommendations to Congress this April. Meanwhile, interest groups are weighing in with their own recommendations. 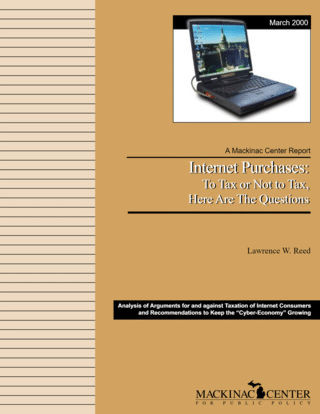 The NGA, the National Association of Counties, and the U.S. Conference of Mayors all support taxing Internet purchases. Others including Americans for Tax Reform, the National Taxpayers Union, and several governors including Virginia's James Gilmore argue against Internet taxation on the grounds that the benefits of leaving the Internet relatively tax-free far outweigh whatever "unfairness" may exist among states' current tax structures. Extend or broaden the current tax moratorium. Congress should make permanent the ITFA's moratorium on "multiple and discriminatory" Internet taxation. Adopt a clear and constitutional taxation standard. Congress should legislatively endorse the U.S. Supreme Court's "physical presence test" for businesses, which makes it clear when and which state and local governments have the right to impose sales taxes. Require that any sales taxes imposed on Internet purchases be "origin-based" so that they will be consistent with the U.S. Constitution and prevailing legal standards. The ITFA and existing Supreme Court jurisprudence do not prohibit all forms of Internet taxation. If policy makers do adopt some form of sales tax, they should ensure it is collected at the source, or point of sale, instead of at the destination, or point of consumption. Look for ways to make Internet access and other telecommunications technologies more accessible and affordable. America's increasingly competitive communications sector also remains one of its most heavily taxed. Policy makers should take advantage of opportunities to eliminate burdensome or antiquated taxes including the three-percent federal telecommunications tax of 1898, discriminatory state taxes on interstate telecommunications, Internet tolls and access taxes, and massive state and local taxes on consumer telephone bills. Introduction: To Tax or Not to Tax?